We are the most dynamic show spectacle ever and we promise you will have never seen anything like this spectacular show before. We have a unique concept of large bright coloured bespoke inflatables all designed with safety and fun in mind. A mixture of exciting race games and skill games awaits you. We use plenty of foam and water especially in the second half of the show when we go into overdrive. We pride ourselves on the razzamatazz, abundance of colour, sound system, various compere's with microphones all together makes the show incredible and completely unique to any other It’s a Knockout experience. When the show is in full swing the atmosphere is totally electric. Don't just take our word for it, just check out our Facebook page to view the comments, photos and videos from our lovely contestants and organisers. "Great show, energetic, entertaining, professionally run, lots of fun and an unforgettable experience." If you book us you will not be let down, and every time we do a show it is different as everything is tailor-made to suit your booking. We have been established for thirty-seven years and have seen competition in this industry grow, but continued re-investment in sound equipment, machinery, costumes, inflatables and perhaps more importantly our skill set within company employees retains our position as market leaders in the field of It’s a Knockout light Entertainment. We remain one of the few full-time It's A Knockout event providers and are very proud of our existing reputation and lasting commitment to quality in all areas of our events. 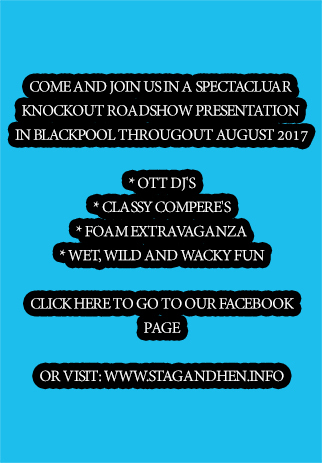 Dave John B's 'It's a Knockout' provides unbeatable Roadshow Entertainment in a safe and controlled environment. Incorporating unrivalled knockout entertainment with an original and extensive list of games and events, state of the art sound equipment, giant inflatables, water pools, mascots and related props, awards and trophies for winning teams, supplemented with individual certificates and medals for winning participants the "Dave John B It's a Knockout" represents good, clean fun for all the family. The only outfit to incorporate Themed Disco Roadshow entertainment, no other It's a Knockout show in the world comes close to Dave John B's presentation style. Our arena set up and presentation is unique as we prefer to get the audience as close to the games and staging area as possible. This adds more flavour and atmosphere to the show with everybody getting to join in the entertainment fully; ensuring no-one is left out. In the pursuit of excellence and in the interests of continuous development, further investment in the company has seen the recent acquisition of a top of the range, purpose built lorry complete with sound show and internal stage aiding top quality presentation and sound to support the show. The recent acquisition of brand new Inflatables, costumes and outfits to ensure maximum visual effect further separates Dave John B's It’s a Knockout from the competition. Dave John B's It’s a Knockout - Simply The Best! ©Dave John B's It's a Knockout. All Rights Reserved.